President Donald Trump speaks during a roundtable on the "Foreign Investment Risk Review Modernization Act" in the Roosevelt Room of the White House, Aug. 23, 2018, in Washington. U.S. President Donald Trump is speaking publicly about the possibility of his impeachment. "If I ever got impeached, I think the market would crash," Trump remarked in a television interview from the White House that aired Thursday morning on the Fox News Channel. "I think everybody would be very poor because without this thinking you would see numbers that you wouldn't believe in reverse," Trump said pointing to his head. The president then questioned how he could be impeached when has "done a great job." Impeachment talk has increased over the past two days after Trump's former campaign manager, Paul Manafort, was convicted of eight counts of fraud by a federal court jury in Virginia. 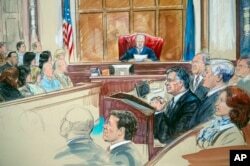 This courtroom sketch shows Paul Manafort listening to U.S. District Judge T.S. Ellis III at federal court in Alexandria, Va., Aug. 21, 2018, with a few of the jurors show at left. The president's long-time attorney and fixer, Michael Cohen, entered a plea in federal court in New York, admitting he paid hush money during the final days of the 2016 presidential campaign to two women who had affairs with Trump and that he did so at the candidate's direction. 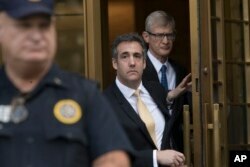 President Donald Trump's former attorney Michael Cohen (C) leaves Federal court, Aug. 21, 2018, in New York. Trump, on Twitter and in the taped television interview, has accused Cohen of saying things that are not true in order to gain favorable treatment from prosecutors. "For 30, 40 years I've been watching flippers," the president said in the interview. "Everything's wonderful and then they get 10 years in jail and they flip on whoever the next highest one is, or as high as you can go." Some political pundits suggest Cohen's admission to campaign finance violations and implicating the president could be grounds for impeachment, but others are expressing skepticism. What is certain is that interest in the topic increased tremendously following Tuesday's dramatic courtroom developments. Queries to the top global search engine, Google, that included the word "impeachment" spiked. But there is almost no chance at present that lawmakers will pursue impeachment because both houses of Congress are in the hands of Trump's Republican party, which with few exceptions remains loyal to the president. If the opposition Democrats are able to gain control of the House of Representatives in the November mid-term election, though, they would be in a position to initiate such proceedings against Trump. White House Press Secretary Sarah Huckabee Sanders told reporters Wednesday impeachment is the only message congressional Democrats "seem to have going into the midterms." House Minority Leader Nancy Pelosi gestures while speaking at the Public Policy Institute of California, Aug. 22, 2018, in San Francisco. Democratic party leaders seem to be cautious, however, about embracing impeachment as a campaign rallying theme. 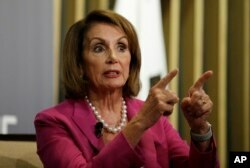 "If there's evidence that the president should be impeached, let that emerge," said House Minority Leader Nancy Pelosi. "I think Republicans would like us to run with the subject of impeachment," added Pelosi, speaking to reporters in San Francisco. "Let me say this about impeachment: you can't be political about it. You can't be political in doing it. And you can't be political in not doing it. We have to seek the truth." Some party strategists express caution that too much talk on the campaign trail ahead of this November's election could alienate independent voters and rally Trump's base. Midterms generally swing in favor of the party out of power and usually generate lower voter turnout than for presidential elections.